Uptown New Orleans has a relatively strong selection of campuses deemed “honor roll” schools by the state, those earning an A or B based on 2011 school performance scores released Wednesday. The lower-performing schools fall roughly into two categories: one group striving upward at varying rates, and similar-sized group continuing to struggle. The only two “A” grades in Uptown New Orleans were awarded to two selective-admissions schools, Lusher Charter and Audubon Charter. Lusher’s score of 155.4 was second-highest in the city (behind only Benjamin Franklin High School, another selective-admissions school), and Audubon scored 120.4. Lusher increased by 9.3 points, and Audubon increased by 6.3, both meeting the growth targets set by the state. The scores of the Uptown schools awarded a “B” all cluster within a few points roughly from 105 to 110: Benjamin Franklin Elementary (111.5), International School of Louisiana (110.8), Eleanor McMain Secondary (108), SciHigh (106.4) and three KIPP campuses. This group saw some of the most substantial change in scores. In addition to SciHigh’s 25-point gain, McMain increased by 19 points over last year. ISL increased by 7.8 points, and KIPP Believe College Prep (111.6) increased by 5.1. “Baby Ben,” also classified a selective-admission school, slid by 2.9 points. 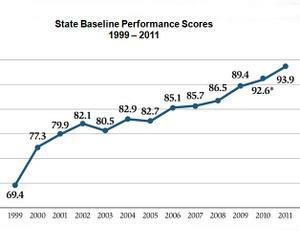 Several schools that received D grades this year, however, did so after substantial gains. Benjamin Banneker Elementary in the Riverbend grew 5.6 points to 66.5. Wilson, Johnson and Banneker all grew to exceed last year’s designation as failing, through they are not out of the woods yet. Next year, the threshold between D and F will be raised to 75. Three other Uptown “D” schools continued their trend of several years of slow growth by increasing about 3 points each — Sophie B. Wright on Napoleon (86.1), Milestone SABIS Academy just off State Street (79.3), and Samuel J. Green Charter near Freret (77.3) — but none met the state’s growth targets. Two Uptown schools that earned high F’s are being evaluated for their first year, so their growth could not be gauged: Batiste Cultural Arts at Live Oak and SciTech Academy at Laurel in the Irish Channel (60.8 and 60.6, respectively). Both are now run by ReNEW Schools, one of the most rapidly growing charter operators in the city. Finally, reflecting what may be another citywide trend, two high schools received low F’s: Sojourner Truth Academy near Freret and Napoleon (48.7) and Walter L. Cohen High School on Baronne Street (28.8). High schools accounted for the five or six lowest schools in the city, and Cohen’s score was lowest among that group. This must be based strictly on statistical analysis as Audubon has one of the worst administrations I have ever had to deal with and its board is a joke. So send your kids somewhere else. No one is forcing you to apply to Audubon. I have friends who had children at Audubon and removed them this year. The administration and board know they are one of the only games in town so they keep doing the same things that have not worked in years. I’m a parent at Audubon too. I’m playing close attention to Dr. Dennis. He is making serious changes. All teachers who were not certified were required to go for training this summer in order to be retained. He has added a disciplinarian to both campuses. And there is now an anti-bullying committee that I think he created.